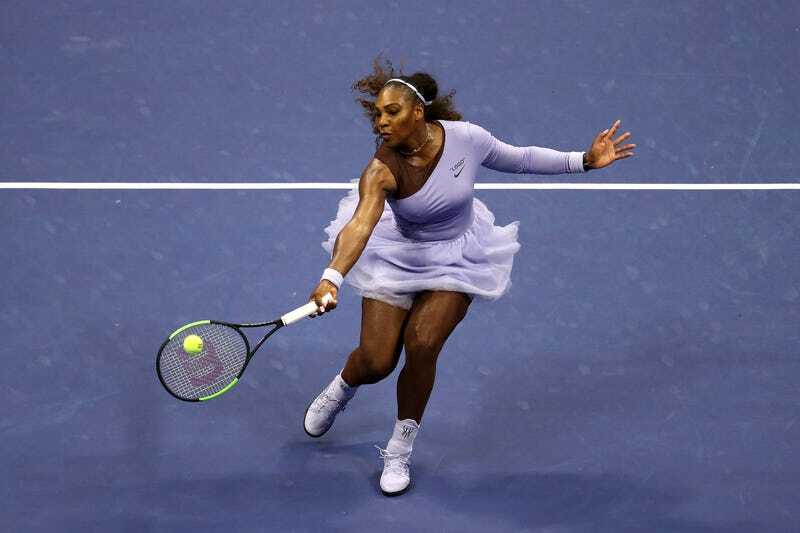 Serena Williams of the United States returns the ball during her women’s singles semi-final match against Anastasija Sevastova of Latvia on Day Eleven of the 2018 US Open at the USTA Billie Jean King National Tennis Center on September 6, 2018 in Queens, New York City. “I love you,” she sheepishly laughed. ... I came here to play that match. If I’m this far, I want to be in Arthur Ashe, playing Serena. I remember that feeling. It doesn’t have to be that I beat her, but just to be there and play against her. I know she’s not No. 1 now as she was two years ago, but she’s still an amazing player. More than amazing, Williams’ rebound back into the game has been nothing short of miraculous, considering that a year ago this week, she was battling for her life after giving birth to daughter Alexis Olympia. Williams tearfully acknowledged that journey after winning the semifinals, and husband Alexis (ever a real one) paid tribute to her tenacity in an emotional pre-Finals post on Friday morning. “She fought for her life, for our child, for recognition, for equal pay, for women’s rights. She never gives up,” he captioned a brief video he’d commissioned for his wife. As for baby Alexis, she showed some love to her incredible mom, too, modeling a miniature replica of one of Williams’ ballet-inspired Off-White x Nike Us Open tennis dresses, minus the toddler-sized compression fishnet tights and Nike Blazer Mids. We’ll be rooting for Serena in the finals on Saturday, but we agree with her: She’s already won. Correction, 9/7/18, 2 p.m. ET: An earlier version of this story incorrectly identified Naomi Osaka as an American competitor. Though raised in America, Osaka competes for Japan. The story has been edited to omit the error.